In episode #014 I presented the spark counter, my custom wireless electricity meter. This electricity meter will only work for 1-phase 2-wire power distribution systems though. Since I have a 3-phase 4-wire system it was time to do it right, with the spark abacus. 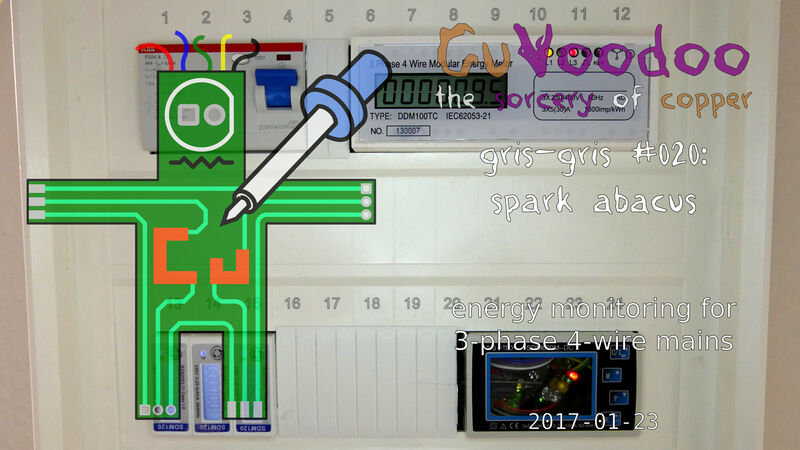 We will explore the different ways to collect electricity consumption measurements: using the S0 impulse output from a 3-pahse 4-wire electricity meter (DDM100TC), using the UART interface of 3 cheap power meters (peacefair PZEM-004T, one per phase), and using the Modbus/RS-485 bus of 3 nice power analyzers (Eastron SDM120-Modbus, one per pahse). A micro-controller (STM32F103) will collect the measurement values and store then using a WiFi module (ESP-01, ESP8266) into a time series database (influxDB) on a single board computer (Orange Pi PC).